Free shipping to the 48 United States. Do you get snow in your area? Want to increase the strength of your Lifetime storage shed? The 60045 is what you are looking for. This snow load kit will increase the snow load capacity of your 8-foot wide shed from 23 pounds per square foot to 30 pounds per square foot. One kit reinforces 1 truss. See below for quantities of snow load kits needed for different Lifetime shed models. Please note that the pictures displayed for this product depict the parts included in the package, and where they are installed, highlighted to have them stick out. The rest of the components shown in the picture are not included and are likely already a part of your 8-foot Lifetime shed. 1 60045 kit reinforces 1 roof truss. Comes with a 10-year warranty from Lifetime Products. 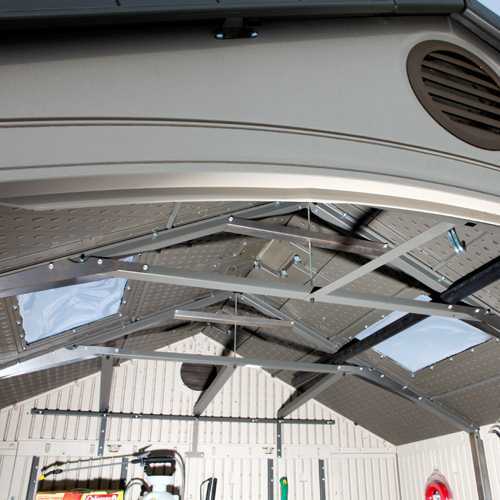 Increases the snow-load capacity of the roof from 23 lbs. per square foot to 30 lbs. per square foot after every truss in the shed is reinforced. 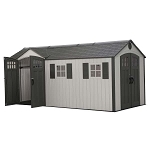 Compatible with 8-foot wide Lifetime storage sheds. Not compatible with Lifetime sheds that are called "side-entry" sheds. That is, sheds that have the door on the longest side. This is compatible with models: 6406, 6418, 6411, 6413, 600910, 60015, 60018, 6405, 6402, 60056, 60085, 60035, 60086, and 60075. Kit includes 4 steel support gussets and 1 short truss brace. An excellent product and highly recommended if you live in areas that receive a lot of snow during the winter. It makes the roof frame so much more stronger with the extra snow load bracing. I own a lakefront second home in Maine and although the 8x5' shed I bought is extremely well built without this extra Snow Load Kit, I feel more secure knowing the roof will be able to withstand a tough Maine winter! Q: How many roof trusses with a #60075 8' x 15' storage shed? Meaning how many of the snow load reinforcement kits do I need? A: 5 Trusses for an 8' x 15' shed. Q: My 8' X 10' shed has a model number 6419 that is not listed as being compatible with your shed roof reinforcement kit. We do not have heavy snow loads in Oklahoma, but we do have strong straight line winds with our thunderstorms and both center panels are broken at the top and need to be replaced on the south side. Neither panel has a skylight in them. Will this kit work on my shed? Can I buy 2 replacement panels for my shed also? A: For that you will need to call 1-800-225-3865. Q: Do the original support trusses have to be removed to attach the snow load kit, or do they attach to the trusses? A: No, you add them in addition to the original support trusses. Q: How many kits do I need for my Lifetime storage shed? 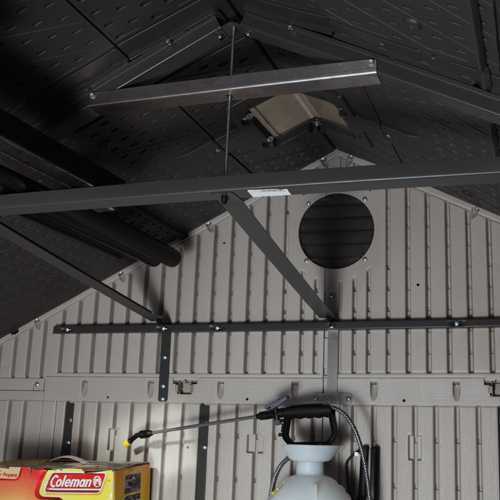 A: The smallest shed that can use this snow load kit is an 8x5 Lifetime shed, such as model 6406 Lifetime shed. This shed has 1 truss, therefore needing 1 kit to increase the strength. From there, Lifetime outdoor shed sizes increase by 2.5 feet. Each 2.5 foot increase in length adds another truss that will need to be reinforced. Thus, the 6411 Lifetime shed will need to snow load kits, and the 6405 Lifetime storage shed will need three kits. 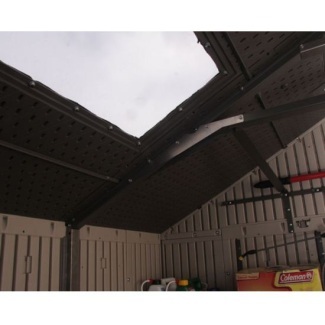 Q: Can this truss reinforcement kit be used with Lifetime garden shed? 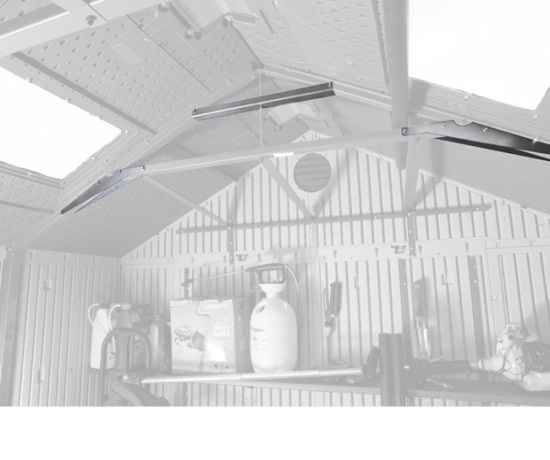 A: These snow load kits are also compatible with Lifetime garden sheds too, but are not useable on all trusses. The 60005, 60001, and 60020 have two trusses this kit can be used to reinforce. The 6446 model can use 4 trusses. 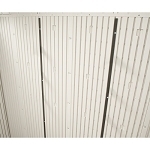 Q: Is the 60045 roof reinforcement kit compatible with Lifetime storage building? A: No. You will need to order the 1034594 snow load kit for your Lifetime storage building (Lifetime sheds that are 11-feet wide). Q: Will this snow-load kit work on non-Lifetime sheds? No. Sorry, it only works on Lifetime brand sheds. Which Lifetime sheds does the snow-load reinforcement kit work with? A: No. Sorry, it only works on Lifetime brand sheds. Q: Which Lifetime sheds does the snow-load reinforcement kit work with? Fast Shipping: When ordered by itself, the 60045 shed roof reinforcement kit ships via FedEx for a doorstep delivery. Orders for the Lifetime 60045 generally leave the warehouse within 1-2 business days. Delivery Details: This product ships directly from the warehouse in Clearfield, UT. This item generally ships via FedEx and may not require a signature. Local Pickup Option: This item may be available for local pickup in Clearfield, UT. If you are interested in picking it up locally contact our customer service for a super cheap pickup quote at 866-308-5484. Dimensions: 22" x 5" x 3"